Looking for the best monitor for FPS games such as Overwatch, Fornite, Call of Duty, Battlefield, CS: GO, etc? In this buyer’s guide, you will be able to find the best display for you as well as everything you need to know before buying a monitor for competitive FPS games. We’ve included various displays in our list including 24″ and 27″ models with refresh rates from 144Hz up to 240Hz, resolutions from 1080p to 1440p, as well as monitors with G-SYNC/FreeSync and/or backlight strobing capabilities. Therefore, we are certain that you will find the best FPS gaming monitor for your budget and preference in no time! Note that all gaming monitors in this list feature TN (Twisted Nematic) panels. In comparison to other panels (IPS and VA), TN panels don’t have as vibrant colors nor as wide viewing angles, but they have the best response time speed for minimal ghosting in fast-paced games which is why professional FPS gamers opt for this panel technology. However, you still need to pick the right screen size, resolution, refresh rate, and other features according to your PC system and gaming preferences. If you’re unsure what specifications to look out for, go to our gaming monitor buyer’s guide where you’ll find all the information you need. Finally, rest assured that all monitors in this list offer the best value for the price in their respective categories and that all of them have input lag under 10ms which is fit for professional gameplay. On a tight budget? 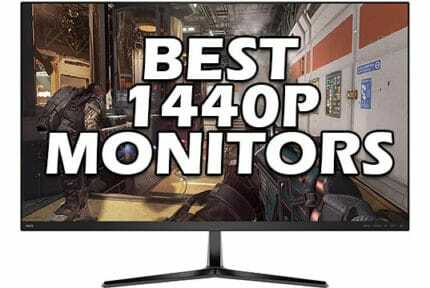 Don’t worry, you can get a good 144Hz gaming monitor under $200 which will provide you with a world of difference in responsiveness and enjoyment for fast-paced gameplay in comparison to the standard 60Hz displays. 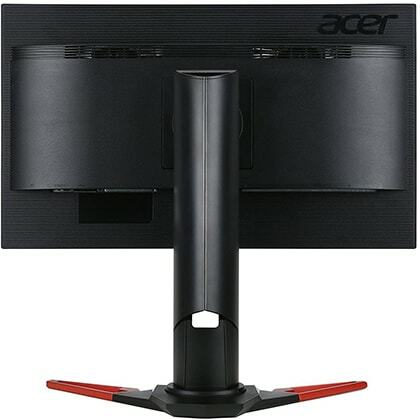 In short, the Acer XFA240 is the best gaming monitor under 200 USD for FPS games. It gives you everything you need for a smooth and immersive fast-paced gaming including a 144Hz refresh rate, low input lag, and a quick 1ms response time speed as well as AMD FreeSync with official NVIDIA G-SYNC compatibility. Additionally, you get a fully ergonomic design. 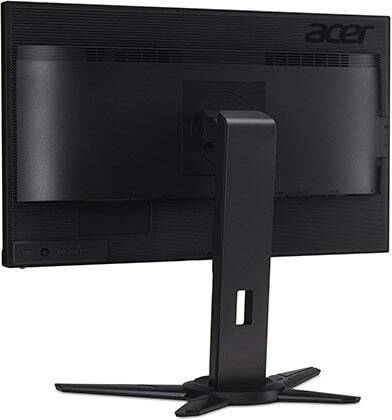 The Acer XFA240 display is based on a TN panel with a 350-nit peak brightness, a 1,000:1 static contrast ratio, 160°/170° viewing angles, a 1ms response time speed, and 8-bit color support via dithering (6-bit + 2-bit FRC). You will find similar specs on basically all gaming monitors in this article. So, you get as good image quality as you can for a TN panel at this price range. 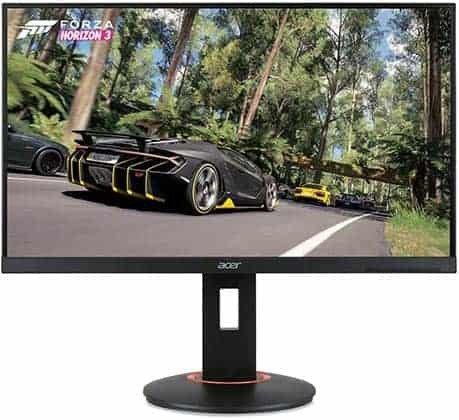 1080p resolution on the Acer XFA240 24-inch gaming monitor provides you with a decent amount of screen space and details, but more importantly, it makes reaching higher framerates easy on your GPU and CPU for smoother gameplay. Moving on, the Acer XFA240 supports AMD FreeSync which allows you to synchronize the monitor’s refresh rate to the GPU’s frame rate. You will need a compatible GPU by AMD or NVIDIA (GTX 10-series, RTX 20-series, or newer). The synchronized refresh rate will eliminate all screen tearing and stuttering as long as your FPS (Frames Per Second) rate is within 48-144Hz range. Below 48FPS, LFC (Low Framerate Compensation) kicks and causes the monitor to multiply its refresh rate according to the framerates for a smoother performance. Some gamers, in contrast, prefer having frame rates over 144FPS in games where it’s possible because screen tearing is less apparent at higher frame rates anyway, while the input lag is lower the higher the frame rate is. 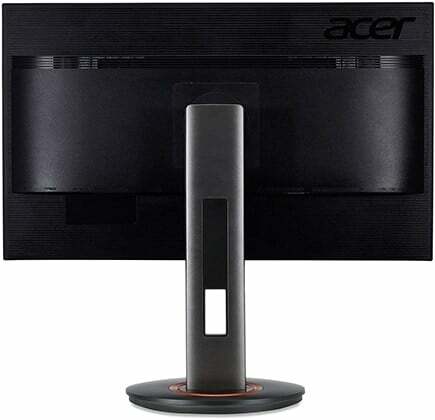 But, since FreeSync doesn’t increase the monitor’s price as it’s an open standard (unlike NVIDIA’s G-SYNC), the Acer XFA240 is a great pick for both AMD and NVIDIA graphics card users. Other features include customizable crosshairs (Aim Point), three overdrive settings (Off, Normal, Extreme), three customizable picture profiles, 6-axis and gamma adjustments, and ‘Black Level’ which increases visibility of objects in dark areas in video games. The design of the monitor is quite robust and versatile considering its price. You can elevate the screen up to 150mm, tilt it by -5°/35°, pivot by 90°, swivel by -/+ 60° or VESA mount it via the 100 x 100mm pattern. Connectivity options are abundant as well with one DisplayPort 1.2, one HDMI 1.4, and DVI-D, a headphones jack, and two 2W built-in speakers available. FreeSync works over DisplayPort with a 48-144Hz dynamic refresh rate range while the range is limited to 48-120Hz over HDMI. Overall, the Acer XFA240 is the best monitor for FPS games under $200. You get a smooth performance with plenty of additional features. The LG 24GL600F offers everything the Acer XFA240 does – plus some extra features including the 1ms motion blur reduction (MBR) technology. 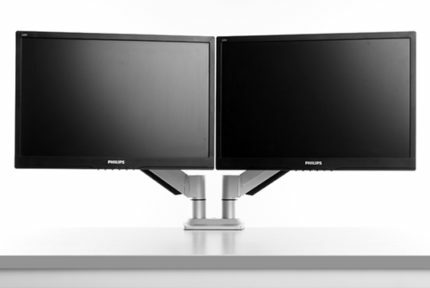 Enabling the motion blur reduction feature causes the monitor to strobes it backlight which further reduces the perceived ghosting and trailing of fast-moving objects providing you with CRT-like motion clarity. 1ms MBR can only work at fixed refresh rates (120Hz or 144Hz) meaning that it cannot be active at the same time as AMD FreeSync. Note that you can use MBR with NVIDIA cards as well. Further, while 1ms MBR is enabled, the display’s maximum brightness will be reduced though you will still have a decently bright picture quality. Either way, you should disable this feature when you’re not gaming. Other gaming features including AMD FreeSync, Black Stabilizer, two FPS and one RTS picture presets, customizable crosshairs, and Dynamic Action Sync which bypasses certain image processing to further reduce input lag. While the LG 24GL600F is not officially certified by NVIDIA for G-SYNC compatibility, it offers a stable performance without any issues. Unlike the Acer XFA240, the LG 24GL600F has a tilt-only stand. However, you can mount it on a third-party stand via the 100x100mm VESA pattern. It has two HDMI 2.0 ports, DisplayPort 1.2, and a headphones jack. FreeSync is supported over both HDMI and DP with a 48-144Hz range. When it comes to the performance, the LG 24GL600F is the best gaming monitor under 300 USD for FPS games if you intend on using its motion blur reduction technology. Want an affordable 27″ gaming monitor for FPS games? Look no further than the ASUS VG278Q, but there are a few things you should keep in mind. Keep in mind that the screen resolution on this 27-inch monitor is also 1080p. What this means is that you’ll have a lower pixel density (pixel per inch ratio) than on a 24″ 1080p monitor and, therefore, less screen space and less vivid details. However, some gamers actually prefer this pixel density. Because there are fewer details (as everything is bigger), the image will be more pixelated which can increase your precision in FPS games such as CS: GO. Most gamers, on the other hand, would prefer a sharper image quality that 24″ 1080p monitors offer. Just like the Acer XFA240, the ASUS VG278Q is officially G-SYNC compatible and moreover, it supports FreeSync with a wide 40-144Hz variable refresh rate range. You will also find the standard gaming features such as ASUS GamePlus (customizable crosshair overlays, an on-screen timer, and an FPS counter) and GameVisual (FPS, RTS/RPG, MOBA, and Racing pre-calibrated picture modes). 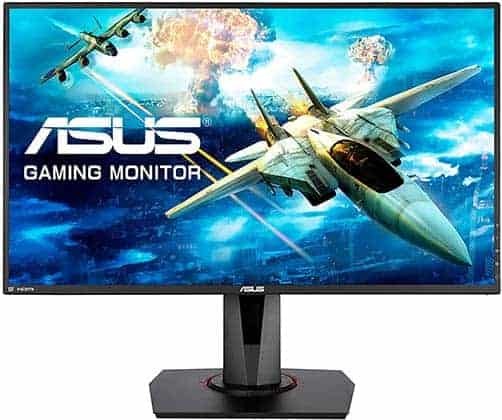 Additionally, the ASUS VG278Q has a motion blur reduction technology called ASUS Extreme Low Motion Blur which can operate at either 120Hz or 144Hz. You can elevate the screen of the ASUS VG278Q up to 130mm, swivel and pivot it by -/+ 90°, tilt it by -5°/33° or mount it using the 100x100mm VESA mount pattern. Connectivity options include a DisplayPort 1.2, an HDMI 1.4 (up to 120Hz), a Dual-Link DVI-D, a headphones jack, and two 2W integrated speakers. In case you want a 27″ 1080p 144Hz gaming monitor, the ASUS VG278Q offers the best value for the money by far. Looking for the best FPS gaming monitor with G-SYNC or 1440p? These cost a bit more but they are certainly worth it if you can afford both the display itself and the PC gear required to properly power it. Unlike FreeSync monitors (including G-SYNC compatible FreeSync monitors) that rely on the Adaptive-Sync standard for VRR (variable refresh rate), G-SYNC gaming monitors have a special module installed in the display. This module ensures a wide VRR range as well as lower input lag and variable overdrive for less ghosting at higher frame rates. 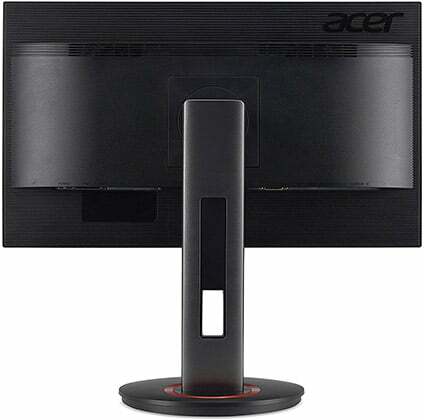 However, it also significantly increases the monitor’s price. 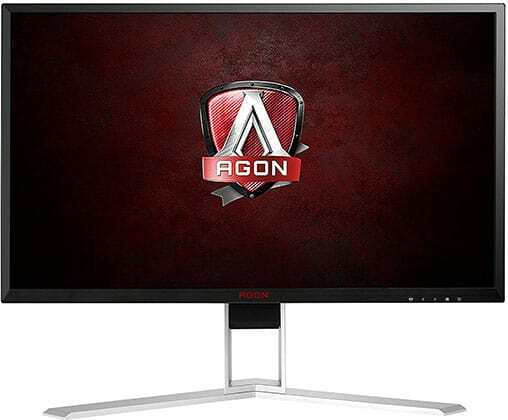 The Acer Predator XB241H is the cheapest G-SYNC monitor and it’s overclockable up to 180Hz which makes it a great choice for those with powerful NVIDIA graphics cards. While the Acer XB241H has a native refresh rate of 144Hz, it’s possible to overclock it to 180Hz in its OSD menu. What’s more, G-SYNC will work all the way from 30 to 180Hz/FPS once the display’s overclocked. Additionally, the monitor supports NVIDIA’s ULMB (Ultra Low Motion Blur) backlight strobing technology. However, it only works with NVIDIA card and at 85Hz, 100Hz, or 120Hz. 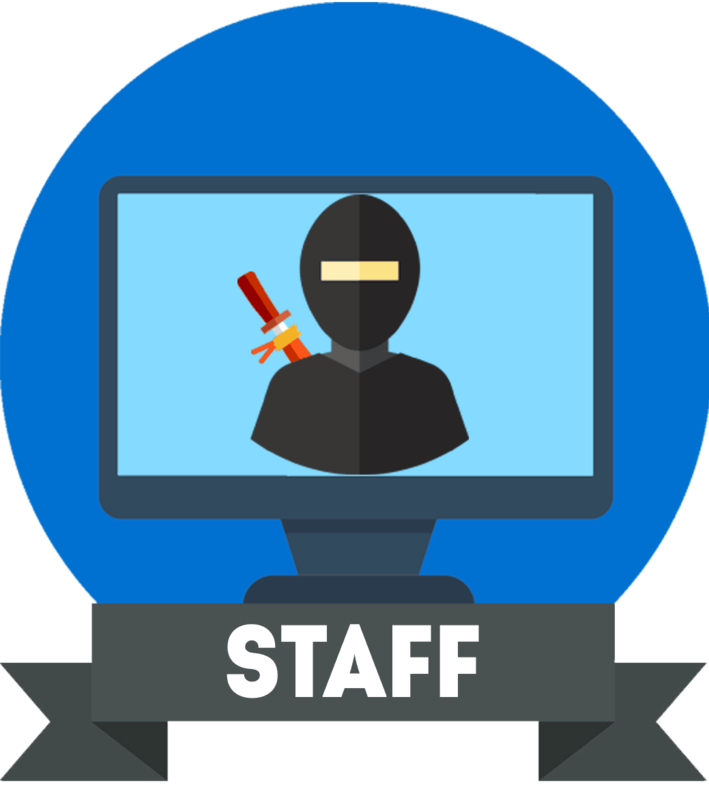 Other gaming features include the Aim Point crosshairs, Dark Boost, and customizable gaming profiles where you can edit/save your monitor settings. Connectivity options include a DisplayPort 1.2, an HDMI 1.4 (max 60Hz), a headphones jack, and two 2W integrated speakers. Turning to the ergonomics, you can elevate the screen up to 150mm, swivel by +/- 30°, tilt by -5°/35°, pivot by 90°, and mount it using the 100 x 100mm VESA mount pattern. 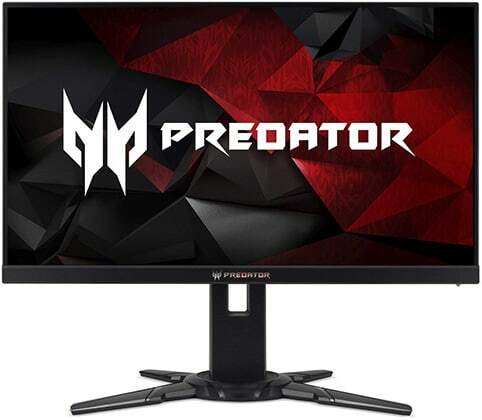 While the Acer Predator XB241H is an excellent monitor, for roughly the same amount of money, you could get a 1440p 144Hz or a 1080p 240Hz gaming display instead. 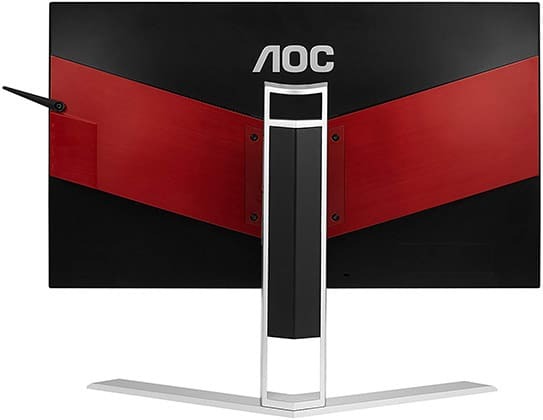 The AOC AG241QX is the best 1440p 144Hz gaming monitor under $350, but it’s only 24″ in size. So, if you can invest a bit extra, we recommend the following 27″ 1440p display instead – unless you prefer a 24″ screen. While 1440p does make everything crisp and sharp on a 24″ monitor, it’s also more demanding to drive at higher frame rates. So, make sure your CPU/GPU can output the desired FPS rate in video games you play. Keep in mind that professional gamers opt for lower resolution displays particularly because of this reason; 1080p is less taxing on your system allowing for higher frame rates and smoother performance. We also find 24″ screen size to be too small for 1440p as you will have to scale the image (to at least 125%) and unfortunately, many applications (including video games) don’t scale well. So, if you decide to go this route, check how well your favorite video games handle scaling. Moving on, the AOC AG241QX supports AMD FreeSync and it’s officially G-SYNC compatible with an impressively wide dynamic refresh rate range of 30-144Hz. Other features include Shadow Control (better visibility of objects in the dark in video games), Low Input Lag mode, and four overdrive presets – but there are no custom crosshairs nor MBR. You also get the QuickSwitch keypad device which you can use to quickly toggle between the picture presets (FPS, RTS, Racing, and three customizable Gamer profiles). The AOC AG241QX offers full ergonomic support with up to 130mm height adjustment, +/- 20° swivel, -4°/22° tilt, 90° pivot, and VESA mount compatibility. Connectivity options include a VGA, a DVI, a DisplayPort, two HDMI 2.0, a quad-USB 3.0 hub, a headphones jack, and two 3W built-in speakers. FreeSync works over both HDMI and DP with a 30-144Hz range. G-SYNC works only over DisplayPort. Overall, the AOC AG241QX offers an exceptional performance for the money, however, we recommend saving a bit more and getting the following 27″ 1440p model instead. You get a better pixel-per-inch ratio and you won’t have any issues with scaling. Interested in a 27″ 1440p monitor? 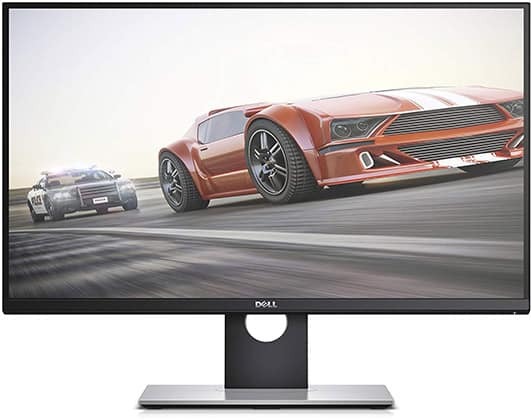 The Dell S2719DGF is the best 1440p 144Hz 1ms gaming monitor you can find for the money! Other than the higher resolution and pixel density, you’re getting the standard TN-like specs including a 350-nit peak brightness, a static contrast ratio of 1,000:1, 160°/170° viewing angles, and 8-bit color depth without dithering. If you’re looking for a more balanced ratio of performance and picture quality, we recommend getting a 27″ 1440p 144Hz gaming monitor with an IPS panel such as the Aorus AD27QD. IPS panels don’t have as fast response time as TNs, but it’s still quick enough to eliminate most of ghosting in fast-paced games. Plus, you get more vibrant colors and wider viewing angles. Moving on, the Dell S2719DGF is overclockable up to 155Hz. It supports AMD FreeSync with a 40-155Hz dynamic refresh rate range and offers a stable VRR performance with G-SYNC. Additionally, you get pre-calibrated FPS, RTS, and RPG picture presets as well as a customizable profile. There’s also the Dark Stabilizer feature but no customizable crosshairs. Ergonomic options include height adjustment up to 130mm, -5°/21° tilt, +/- 45° swivel, 90° rotate, and 100 x 100mm VESA mount compatibility. At the back of the monitor, you will find an HDMI 1.4 (max 60Hz), an HDMI 2.0, (max 144Hz), a DisplayPort 1.2 (for 155Hz), and a quad-USB 3.0 hub (one port with fast-charging). 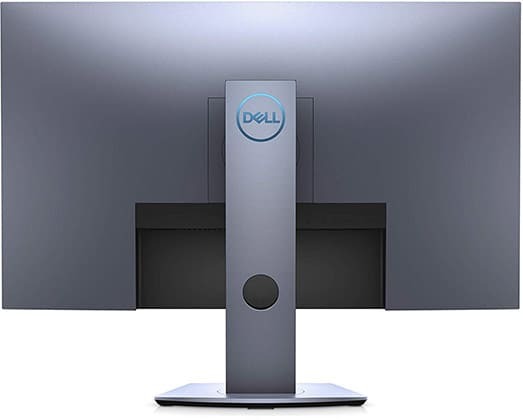 While the Dell S2719DGF offers excellent specs for its price, we recommend getting a 240Hz monitor instead if you want the smoothest performance – or a 1440p 144Hz IPS monitor if you want a good balance between performance and image quality. In case you mostly play undemanding games which will run past 155FPS at 1440p, then the Dell S2719DGF will suit you well. Alternatively, you may want to consider the Acer XG270HU 27″ 1440p 144Hz 1ms gaming monitor which is a bit less expensive, but the advantages of the Dell S271DGF are worth the extra cost. The Dell S2716DG is basically the G-SYNC version of the Dell S2719DGF with a few additional differences. 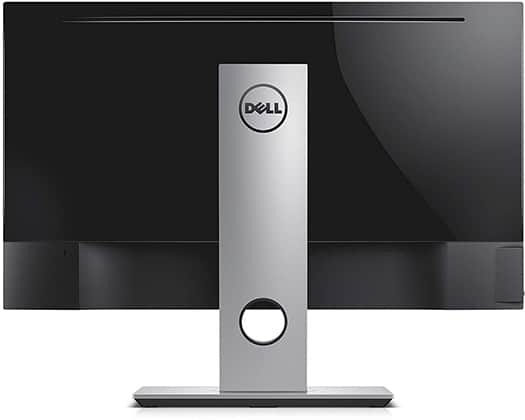 Note that both the Dell S2716DG and the Dell S2716DGR are the same monitors. The ‘R’ suffix stands for ‘Retail’. Although it’s not overclockable, the Dell S2716DG offers NVIDIA’s ULMB technology. You can use it at 85Hz, 100Hz, and 120Hz. 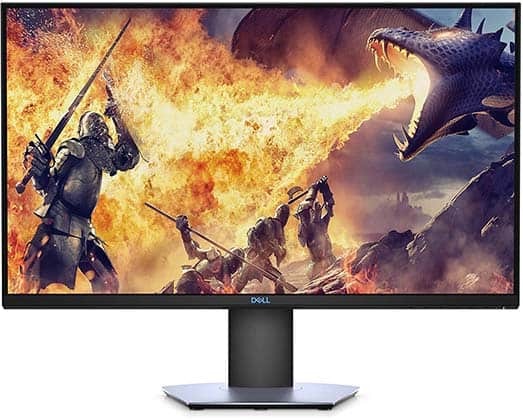 The 24″ model of this monitor, the Dell S2417DG, can be overclocked up to 165Hz, but we find the 27″ model to be better for the price; besides, at 1440p, 144Hz is plenty. Unfortunately, the Dell S2716DG doesn’t have as many gaming features as the S2719DGF. There are no FPS pre-optimized presets, no Dark Stabilizer, and no custom crosshairs. Just like the Dell S2719DGF, the Dell S2716DG G-SYNC gaming monitor offers premium design quality with tilt, swivel, pivot, height, and VESA adjustments. Connectivity options include a DisplayPort 1.2, an HDMI 1.4 (max 60Hz), and a quad-USB 3.0 hub. Alternatively, you may be interested in the Acer Predator XB271HUA. 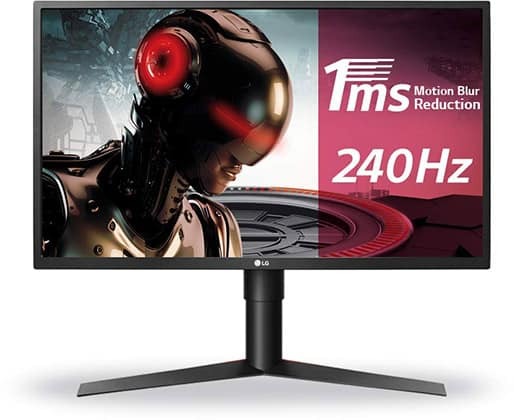 It costs a bit extra, but it’s a 27″ 1440p G-SYNC gaming monitor with a 165Hz overclockable refresh rate, ULMB, and other features including crosshairs, precalibrated picture presets, etc. 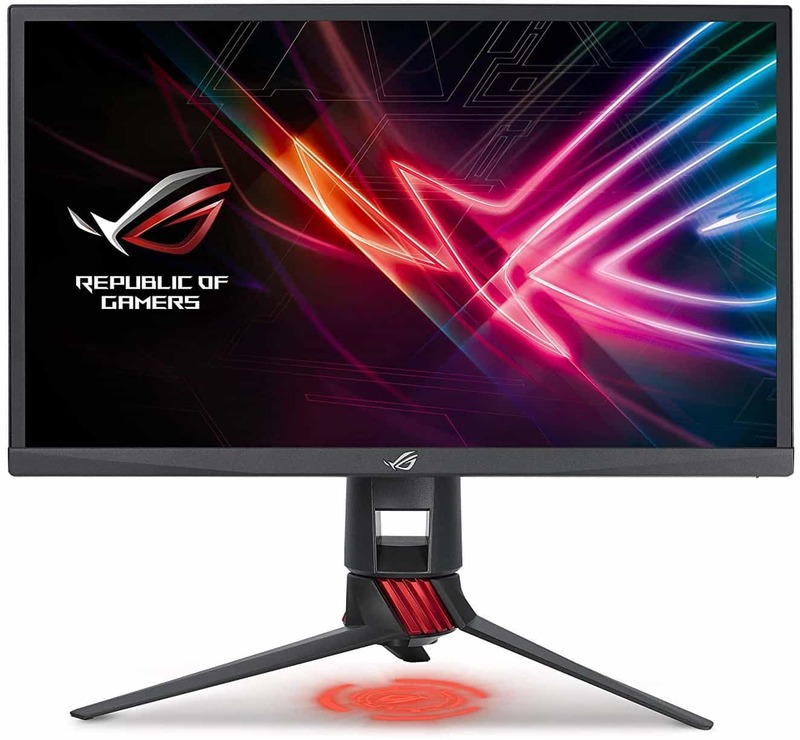 The same monitor is also available with an IPS panel with a slightly slower response time speed but better color reproduction and wider viewing angles, the ASUS ROG Swift PG279QZ. While some 240Hz gaming monitors are even cheaper than certain 144Hz displays, keep in mind that you will also need a more powerful CPU/GPU system to run games at such high frame rates. 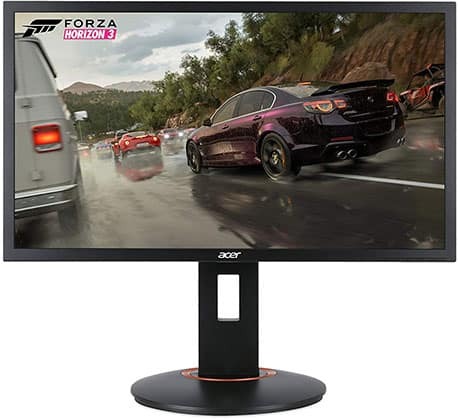 The Acer XF250Q Cbmiiprx is the cheapest 240Hz gaming monitor around yet it’s equipped with everything you need for a flawless performance when it comes to competitive gaming. As far as the image quality is concerned, you’re getting a newer TN panel which is slightly brighter (400-nit peak luminance) and bigger (24.5″ viewable screen) than the 24″ TN models previously mentioned. Moving on, the Acer XF250Q supports AMD FreeSync (NVIDIA-certified G-SYNC compatibility) with a 48-240Hz dynamic range, and has customizable crosshairs as well as Black Boost (increases visibility in darker games). Alas, there’s no motion blur reduction technology, but with a 240Hz refresh rate at this price, you can’t go wrong. You also get an excellent design quality for the price with full ergonomic support including up to 150mm height adjustment, 90° pivot, +/- 60° swivel, -5°/35° tilt, and 100 x 100mm VESA mount compatibility. Turning to connectivity options, there’s DisplayPort 1.2, HDMI 2.0, HDMI 1.4 (144Hz max), a headphones jack, and two 2W integrated speakers. FreeSync works over both HDMI 2.0 and DP with a 48-240Hz range. Overall, the Acer XF250Q provides you with a professional-grade gaming performance for an affordable price which is why we highly recommend it to aspiring professional gamers on a budget. If you want both 240Hz and motion blur reduction at an affordable price, the ASUS XG248Q is for you. 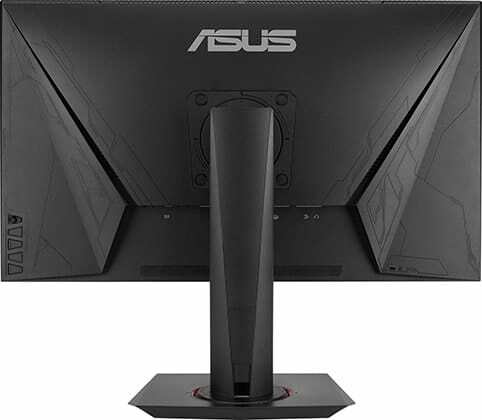 The ASUS XG248Q 23.6″ 240Hz monitor is actually a newer version of the ASUS XG258Q which is a 24.5″ model. So, while it is slightly smaller in size, it also offers a slightly higher pixel density. Further, unlike many 24.5″ 240Hz models with backlight strobing, the XG248Q can actually strobe all the way up to 240Hz as well as at 200Hz, 144Hz, and 120Hz. 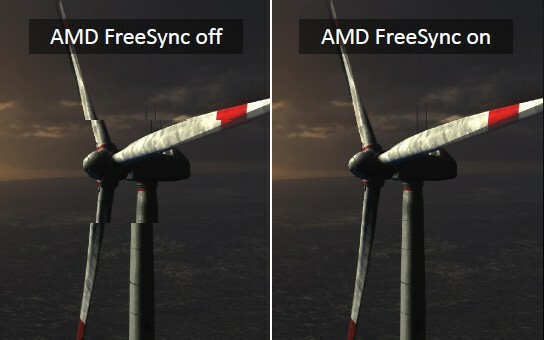 It also supports AMD FreeSync and it’s officially G-SYNC compatible. Other features include six response time overdrive options, pre-calibrated picture presets, customizable crosshairs, and AuraSync and ROG logo projector RGB lighting. 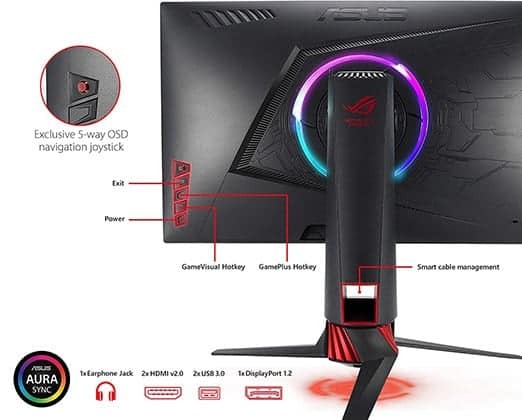 The ASUS XG248Q 240Hz gaming monitor boasts a fully ergonomic design with height, tilt, swivel, pivot, and VESA adjustments. Connectivity options include two HDMI 2.0, a DisplayPort 1.2, a dual-USB 3.0 hub, and a headphones jack. All in all, the ASUS XG248Q offers everything a serious gamer may need – compatibility for both FreeSync and G-SYNC VRR, 240Hz refresh rate, 1ms response time, MBR up to 240Hz, and six overdrive options allowing you to perfectly tune the display to your gameplay preference. 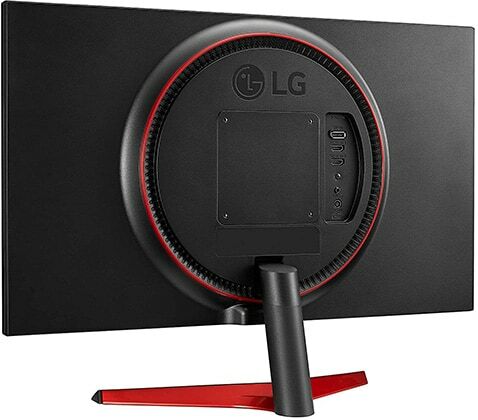 If you want a 27″ 240Hz gaming monitor, the LG 27GK750F with motion blur reduction offers the best value for the money. 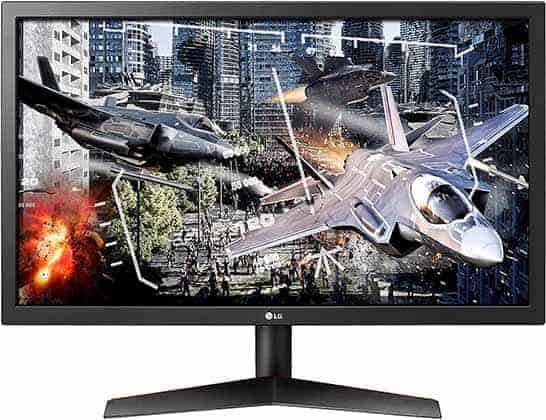 The LG 27GK750F monitor supports AMD FreeSync with a 48-240Hz range over both HDMI and DP and it also provides a stable VRR performance with compatible NVIDIA G-SYNC cards. Other gaming features include Black Stabilizer, Dynamic Action Sync, custom crosshairs, four response time overdrive modes, and pre-calibrated picture presets (two FPS, one RTS, and two custom modes). Moreover, it’s one of the rare 240Hz monitors that can actually strobe the backlight at 240Hz, others usually being limited to 144Hz. You can also use the 1ms Motion Blur Reduction technology at 144Hz and 120Hz. 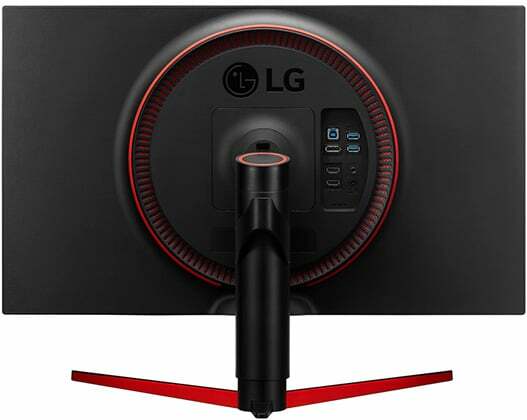 The LG 27GK750F has a fully ergonomic design with up to 110mm height adjustment, 90° pivot, +/- 20° swivel, -5°/15° tilt, and 100 x 100mm VESA mount compatibility. Connectivity options are abundant and include two HDMI 2.0 ports, a DisplayPort 1.2, a dual-USB 3.0 hub, and a headphones jack. Thanks to its plethora of gaming features and smooth performance, the LG 27GK750F is the best 27″ 240Hz monitor for the money. Want a 240Hz gaming monitor with G-SYNC? The Acer Predator XB252Q is the most cost-effective options albeit it’s still expensive. As we’ve mentioned earlier, screen tearing is less apparent the higher your frame rate/refresh rate is; so, at 240Hz, it is arguable whether g-sync is worth it or not. Besides, G-SYNC adds additional input lag (although very little, around 1ms) and it limits your frame rate to ~240FPS; it’s recommended to limit your frame rate to -2FPS or -3FPS of the monitor’s maximum refresh rate for minimal input lag penalty of G-SYNC. So, most gamers will turn G-SYNC off and have uncapped frame rates for the minimal input lag, however, some players prefer gaming with G-SYNC as it provides a smoother ‘feel’ while others prefer using backlight strobing. In the end, it’s up to your personal preference. We don’t recommend getting a G-SYNC gaming monitor if you mainly play undemanding FPS games. If you also run the latest AAA titles from time to time, investing in a G-SYNC monitor is worth it as you’ll get a better performance in more demanding games and thus future-proof your system. Other than G-SYNC, the Acer XB252Q offers all the features common for the Predator series including custom crosshairs, Dark Boost, three game modes (Action, Racing, and Sports), response time overdrive settings, and ULMB. ULMB works at 100Hz, 120Hz, and 144Hz. It doesn’t work at 240Hz like on the previously mentioned LG and ASUS models. Regardless, backlight strobing at 144Hz is sufficient as there’s no strobe crosstalk or other visuals artifacts. Further, with the ULMB Pulse Width option, you can also adjust the frequency of the strobing; the higher the frequency, the lower the maximum brightness and vice versa – this option isn’t available on the LG model. At the back of the monitor, you will find an HDMI 1.4, a DisplayPort 1.2, an audio line-out for the headphones, a line-in for the 2x2W built-in speakers, and a dual-USB 3.0 hub. Ergonomic options include VESA mount compatibility, up to 115mm height adjustment, +/- 45° swivel, -5°/21° tilt, and 90° pivot. If you want to unleash to the full potential of your NVIDIA card and you enjoy playing both competitive shooters and modern, more demanding games, the Acer Predator XB252Q will ensure flawless performance in both scenarios. 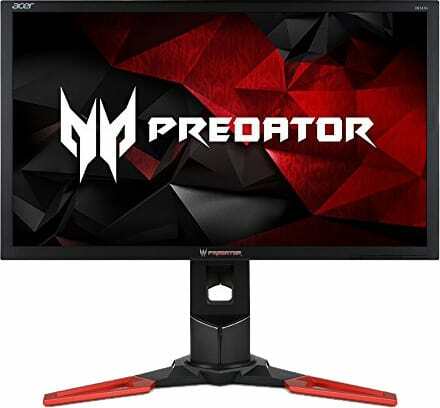 The Acer Predator XB272 is the 27″ version of the XB252Q. So, for a slightly higher price, you get a bigger screen but a lower pixel density. In this case, deciding which one is better is just a matter of taste. Finally, we get to the BenQ ZOWIE XL2546 which is the #1 choice of most professional gamers. The main asset of the BenQ XL2546 is its DyAc (Dynamic Accuracy) feature which is currently the best motion blur reduction technology. Right out of the box, the BenQ XL2546 delivers the best performance for competitive gaming. Dynamic Accuracy works all the way up to 240Hz and it has the lowest brightness penalty out of all blur reduction technologies. Other features include Black eQualizer, Color Vibrance (20 levels of color saturation), three overdrive modes, and pre-calibrated picture presets (two FPS, one RTS, and three customizable profiles). It also comes with the S. Switch device which you can use to quickly swap between picture presets; you can customize the functions of these three buttons. Lastly, you get the shading hood which ensures minimal distractions allowing you to focus on the game. 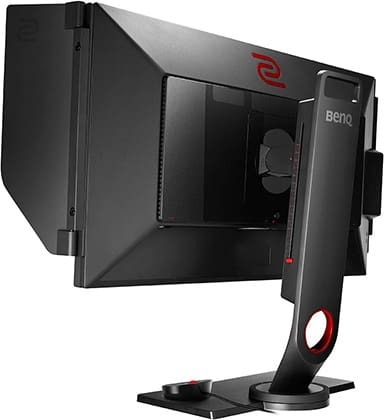 The BenQ ZOWIE XL2546 has a special frame design which eliminates reflections. It also has a versatile stand with up to 140mm height adjustment, +/- 45° swivel, 90° pivot, -5°/20° tilt, and VESA mount compatibility. Connectivity options include two HDMI 2.0 ports, a DisplayPort 1.2, a Dual-Link DVI, a headphones jack, a microphone jack as well as three downstream and one upstream USB 3.0 ports. Want the absolute best performance for FPS games? Go with the BenQ XL2546. However, due to its high price, we only recommend it if you’re a professional gamer or intend on going pro; otherwise, the above-mentioned 240Hz G-SYNC models offer better value for the money. Have you decided which gaming monitor to go with? If you have any additional questions or you’re having second thoughts, feel free to ask us in the comments below for further advice. Overall, the Acer XFA240 will provide you with everything you need for a buttery-smooth gaming experience. In case you prefer using the backlight strobing technology, the LG 24GL600F is the better option for you. If you already own a 144Hz gaming monitor or have bigger ambitions, the ASUS XG248Q will ensure you’re on par with the professionals for a very appealing price. 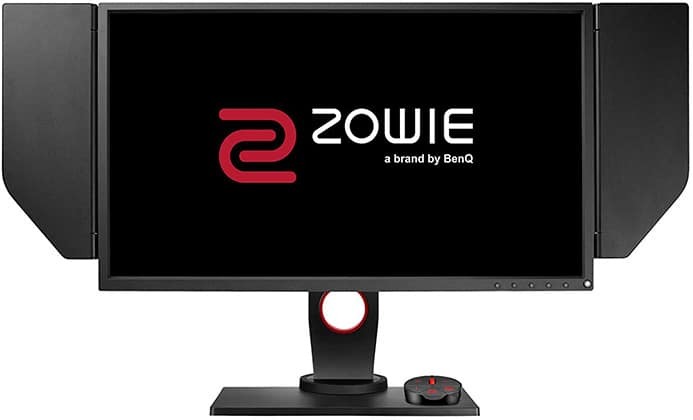 Finally, if budget is not an issue and you want the absolute best performance straight out of the box without any compromises, the BenQ ZOWIE XL2546 offers just that.